The Japanese have taken a large interest in the moon and are determine to map it in incredibly high detail. SELENE stands for “Selenological and Engineering Explorer." 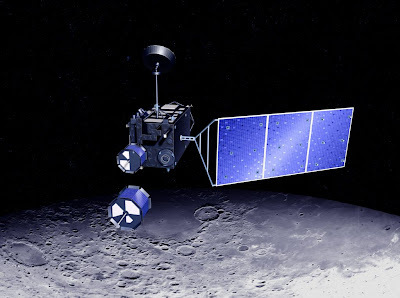 also known as "KAGUYA" carries two daughter satellites that will be deployed at different points that will work together to bring back the most information ever collected from the moon. The map they put together is far more detailed then any map made by NASA, and so far has collected six million points of data from the surface. It has been determined there are deposits of uranium, potassium and thorium and have been pin pointed with the use of the on-board spectrometers. There have now been talks of mining projects on the moon and are now looking for largest deposits of uranium in order to render a nuclear power source for a human settlement. Now you might ask what's the big deal? The big deal is these high-res images that are going to come back from KAGUYA should reveal any kind of alien structures on the moon. NASA has release thousands of photo's from the Apollo missions, but many seem to have been doctored in order to hide something. There are specific large areas that were blurred to what look like large structures. There is a HI-def camera circulating the moon has we speak, the truth could be revealed to the world, the pictures have already been taken. My question is why can't we see them. The only pictures that have been released from KAGUYA are from the near side of the moon and don't really show much detail. Not ONE photo of the back side. There was going to be a open gallery of all the photos open to the public and was going to be posted in April or May of 2009. No one is quite sure what's going on, all we know is not much of anything is being realesed. They also had a questionnaire linked to their website and people started to inquire about the the pictures wondering when they would be posted. No questions or requests have been answered and the link was taken down May 11th. Sounds like some kind of intervention has taken place. After looking at the very few HD photo's taken by KAGUYA of the moons surface it's truly disappointing. No details of any kind and almost out of focus. There are about a dozen or two HD movies that they have posted, but it's in a super small view finder, which make no sense because it's in HD for crying out loud! It also goes by so fast you can't make anything out but large details. Watch KAGUYA's promotional video and what they state they are going to do. One of the reasons I feel there's more to meets the eye with the moon is the fact that are far more topical images of Mars then there are of the moon. They even have a "Google Mars" just like Google Earth. What about the moon? It makes me mad the fact that all the pictures are being held hostage from the public. It's almost imposable to find any true close up's of the moon. not to mention NO real pictures of the back side. Mars, no problem! The moon, what's the problem? The math just does not add up. Why so much secrecy? How freaking hard is it to take a plain old non-doctored close up color photos of the moon. With the technology that's out there, I mean you got to be kidding me. If there is nothing to hide, then where's Google Moon? There have been thousands of requests to take photo's of the areas in question. But non have been made. Why? They were taking requests from civilians to photo any coordinates on mars for about three years. That's never been the case with the moon. There has got to be more than meets the eye, otherwise all the images of the moon would be open to the public. Oddly, while I was writing this post, I now can not establish any connection with their server, "Failed to Connect" message keeps coming up wms.selene.jaxa.jp. You can still some pictures and movies from the Japan Aerospace Exploration Agency, or JAXA. The best way to find anomaly's on the moon are still the Apollo mission archives. My next post is going to be on the Apollo 11 photo's and the lights that are mysteriously in the dark areas. Attain the knowledge that will set the human race free of this controversy, if you don't take the time to see what's really going on around you, you'll roam the earth as a zombie living the life you feel you have to live. In order to make a change you must change your beliefs, attain the mind you were meant to have and together we can free the human race.